Supporters of Europe’s Galileo system got some good news today (June 22, 2011) at the Paris Air Show: savings in the program have freed up funds that may be able to support acquisition of at least six additional spacecraft by 2014. Taking part in a signing ceremony for the final Galileo work packages, European Commission Vice President Antonio Tajani announced that improved program management and cost-cutting by industry vendors could free up €300 million ($482.8 million) — enough to ensure that 24 satellites could be launched by 2015. Meanwhile, the Russian Space Agency’s new chief, Vladimir Popovkin, said he is seeking 402 billion rubles ($14.35 billion) to fund the GLONASS program through 2020. According to a Moscow Times report, the funds would be used to maintain the system’s satellite satellite constellation, develop digital navigation maps for GLONASS users, and, combined with financing from Russian regions, to develop supplemental technology to enhance GLONASS applications. Also at Le Bourget where the annual air show is held, industry and government officials signed contracts totaling €335 million for Galileo’s ground control segment (Work Package 3 — WP3) and ground mission segment (Work Package 2 — WP2). France’s Alenia Space will receive €281 million for WP2 to generate all the products for supporting navigation services and maintaining their accuracy. The WP3 allocates €73.5 million to Astrium-UK to ensure the good “housekeeping” of the satellites, including the maintenance and correct positioning of the spacecraft in orbit. But Tajani’s announcement upstaged the contract signing and represented some very good news for a €3.4-billion ($4.9-billion) program that has suffered delays and cost overruns, forcing Galileo managers to reduce the initial launch plan to 18 satellites from 30 by the end of 2014. Recent estimates had placed the cost of completing the full constellation at €1.9 billion. However, the savings should enable the program to request less money and complete the system more quickly. The program probably will ask its current satellite supplier, OHB-System of Germany, to build additional spacecraft or possibly turn to Astrium, its back-up supplier. The first launch of fully operational Galileo satellites — two so-called in-orbit validation (IOV) spacecraft —is scheduled for October 20 from the Europe’s spaceport in Kourou, French Guiana. 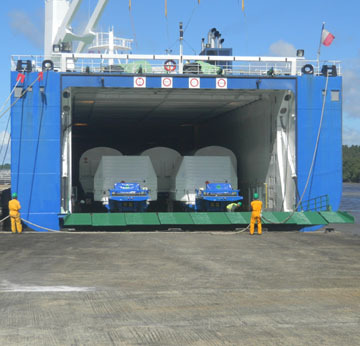 The Russian Soyuz ST-B launchers that will carry the satellites into space, including another pair in mid-2012, arrived in French Guiana on June 18. The October launch will be the first flight of a Soyuz rocket from a newly built launch facility at Kourou. The first two Galileo satellites — known as PFM and FM2, for Protoflight Model and Flight Model 2 — are currently undergoing their final qualification and acceptance tests at Thales Alenia Space in Rome, Italy. An interesting historical aside: the good news for Europe’s much-criticized GNSS program came on the 378th anniversary of the day the Inquisition forced the system’s namesake, Italian astronomer and inventor Galileo Galilei, to say he was wrong — that the Earth did not revolve around the sun.